In our daily life, the integration of different sensory modalities seems to be effortless and automatic. However, our brain must integrate the information from the individual sensory systems into a coherent "object" or segregate it into several "objects". In various projects, we investigate the temporal and spatial factors of this integration process. 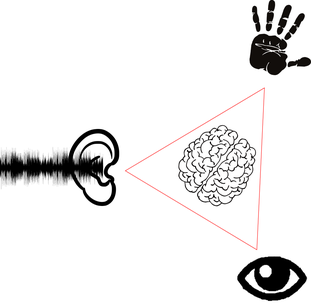 In this subproject, we investigate cognitive and neural mechanisms when audiovisual and audiotactile events are perceived as synchronous or not. To this end, we use behavioral experiments, electrophysiological procedures (EEG / MEG) and fMRI. Themain goal is to identify temporal dynamics and the neuroanatomic correlations that underlie multisensory integration. Furthermore, we focus on the interplay between audiovisual / audiotactile integration and top-down processes, as well as the similarities and differences of audiovisual and audiotactile integration. Project in cooperation with Prof. Dr. Hans-Joachim Heinze. For further information one the SFB TR31 please visit the website. In this project, we investigate the integration of auditory and visual information using three-dimensional and thus naturalistic experimental settings. 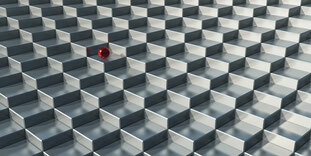 We are particularly interested in the prediction of moving objects when part of the information is unavailable (e.g. by visual masking, auditory masking). In addition to behavioral experiments, the temporal dynamics as well as the neural correlates of these functions are investigated using EEG and fMRI. 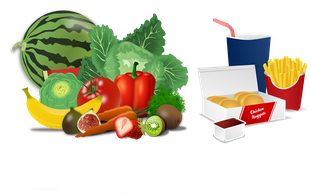 Hunger and appetitive behaviour play a central role in daily food intake. Also, with respect to the high prevalence of obesity and eating disorders, it is important to learn more about the basics of the regulation of food intake. In our lab we examine which brain regions play a part in perception and processing of visual food cues. Moreover, we want to find out how visual and gustatory stimuli are integrated. An important objective for the study of ingestive behaviour should be the understanding of the fundamentals of the underlying senses. This project investigates the perception and neural representation of primary rewards/reinforcers, i.e. tastes, of their visual correspondences, i.e. secondary reinforcers, and of their (mis)matched combination in the human brain. 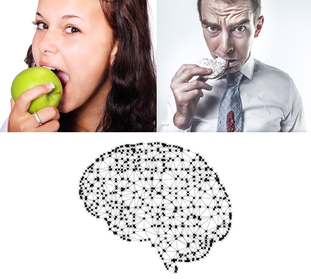 The aim of this project is threefold: (1) to identify in humans the motivational, hedonic and category-specific neural representations of primary reinforcers (sweet, sour etc. ), (2) to identify the influence of secondary reinforcers (i.e. predictors of primary reinforcers) on motivational, hedonic and category-specific primary reinforcer representations and (3) to identify the effects of overlearned and novel visuogustatory correspondences on these representations and their functional interplay. The aim of this project is to extent existing brain research methods so they can be used easily (and as a matter of routine) in clinical research and diagnostics. Here we focus on a combination of electroencephalography (EEG) and functional resonance tomography (fMRI). Unfortunately, the fMRI gradient strongly alters the EEG signal, so that large artificats have to be corrected before evaluation of the EEG signal is possible. In addition, head-movements and helium pumps of the scanner further alter the EEG signal. All these artifacts cannot be easily corrected and current artifact correction methods are insufficient. Thus, a clear interpretation of the EEG signals is often impossible. 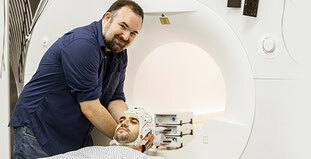 THis project aims at providing a new method to reject artifacts in EEG-fMRI measures and to make combined neuroimaging measures more user friendly. The project is financed by the State of Saxony-Anhalt and the European Fond for Regional Development (EFRE 2014-2020) in the framework of the Center for Behavioral Brain Sciences – CBBS (project funding reference number: ZS/2016/04/78113).